Notes Address Book Converter is a proficient tool to Export Lotus Notes Contacts file to Outlook file format. Using this Contacts Converter tool you can easily Transfer Lotus Notes to Outlook. Due to multiple output functionality you can do Lotus Notes Contacts Export to Excel and vCard format. These two formats are the universally accepted formats. You can convert unlimited Lotus Notes contacts to Outlook very easily speedily without using any technical skills and precious time. The best part of this software is that it can export Lotus Notes Contacts file in its original shapes. All the contact information from Lotus Notes address book remains as is. After this conversion process you can find all the contacts information like, Business Address, Business Contacts, Personal Information, Advance Information, Briefcase Information. 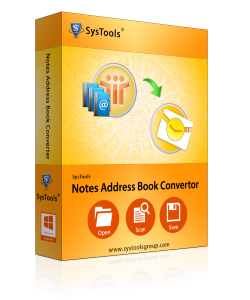 Notes Address Book Converter works fine and move Lotus Notes Contacts to Outlook with Lotus Notes 8.5, 8.0, 7.0, 6.5 and 6.0, 5.0 MS Outlook 97, 98, 2000, XP, 2003, 2007, 2010, 2013 and 2016. To gain better understanding about this software we recommended you to use Free Notes Address Book to Outlook Demo version. Using the free evolution software you can Convert ANY 15 items from your Lotus Notes Contacts to Outlook.